How did you want your item personalized? 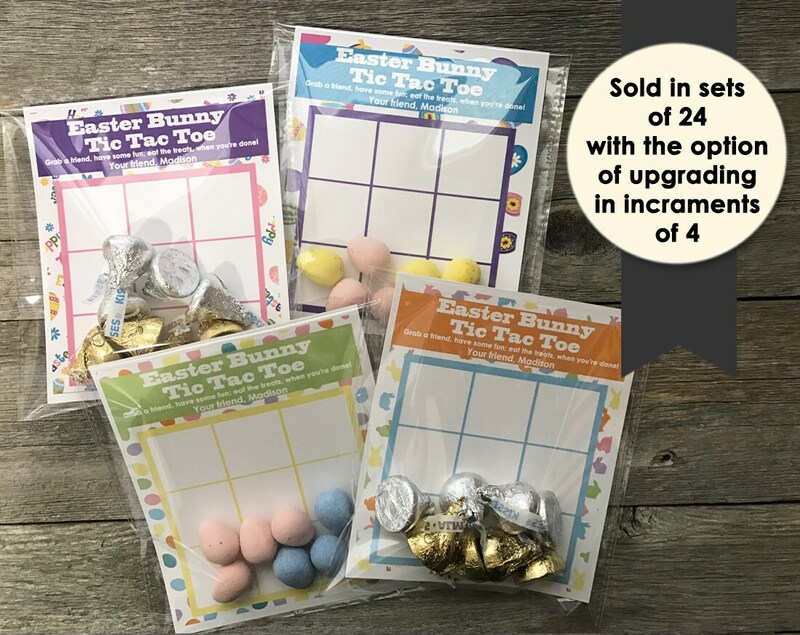 Easter Tic Tac Toe Favors printed cards and bags. 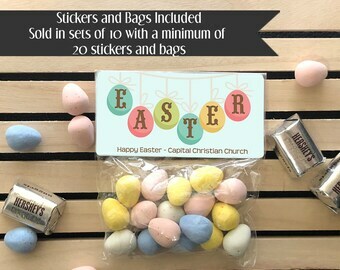 A very easy and convenient way to give out Easter Favors to family, church members and friends. Candy and favors NOT included. These are great for everyone and so easy to put together. MY TURNAROUND TIME: These will be shipped out with in 1-2 business days. *If you need it sooner please convo me to see if it is possible BEFORE placing your order. Included are 4x6" self sealing bags and personalized Tic Tac Toe boards. Fill the bags with kisses, M&M's or any other favorite candy to play tic tac toe with. You place the board in the self sealing bags, add your candy or favors, fold over the bag and seal. That easy! In the notes to sellers section during checkout, please enter the name for personalization. Easy to hand out at schools, daycares, churches or family and friends. I had a million questions about the product and customization. The seller was extremely prompt answering questions and even sent a sample of what the product would look like. Once I placed the order, the processing and shipping was extremely fast. It's a great idea for celebrating happy events. I had candy wrappers for our daughter when she was born and I am getting them now that she is graduating nursing school. Can't wait to see her reaction. These are perfect! Just what I needed for my friends baby shower. Thanks!!!!!! Since our items are mostly digital, once the digital file is emailed out we are sorry no refunds can be given. We have been in business for 9 years and rest assured your file you receive is large enough to print. Please double check your proofs once given, on printed items we can only give refunds for printing errors. If you approve the proof we can not be held responsible for customer error. ****If you are purchasing close to your event, please know you are taking the risk of ordering them too close to your event. No refunds will be given on shipping delays if you purchase the item within 7 business days of your event and priority shipping was not chosen as the shipping method. 7 business days gives your item a couple extra days to receive them due to shipping delays. -If the package is lost a refund will be given or the item will be reprinted and shipped back out. We will file a claim with the Post Office. Proofs are given on invitation orders only unless you ask for one. If you wish for a proof please let me know in the notes to sellers section during checkout. PLEASE DOUBLE CHECK YOUR SPELLING AND ACCURACY WHEN LEAVING YOUR INFORMATION IN THE NOTES TO SELLERS SECTION. We ship out with in 48 hours after you place your order. The shipping days quoted are AFTER the 48 hour processing window and NOT from the date you place the order. *** We are not responsible for shipping delays once they leave our hands. We ship by USPS and if it's due to bad weather or just a delay by the Post Office no refunds will be given.